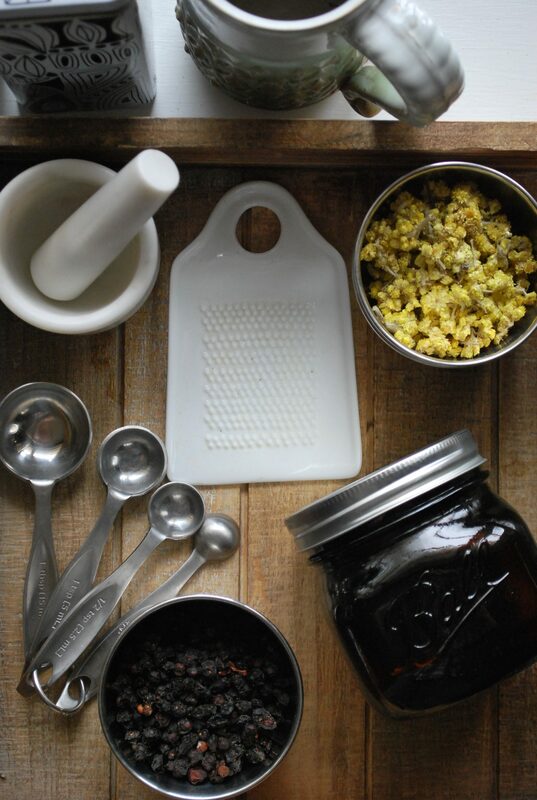 Although you don’t need a lot of tools to start making herbal extracts and teas, it does help to have a few quality things like glass canning jars, a good kettle, and a sturdy coffee grinder. 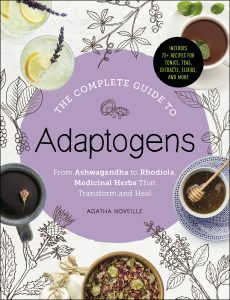 I’ve been studying herbalism in a focused way since I was 19. That translates to 14 years of formal study! Over the years, I’ve found that there are certain tools that get a lot of use when I make extracts, teas, and other herbal recipes at home. This list isn’t set in stone, of course – I’ve experimented a lot and my favorites are different now than even five or six years ago. That’s part of the fun! I thought you might enjoy a peek at which specific tools I’ve ended up with and why, so I’ve given you a list of my favorites below. Sometimes I use affiliate marketing to support my writing here on the blog. Purchases made through the links below will give me a small commission that helps pay for website upkeep. 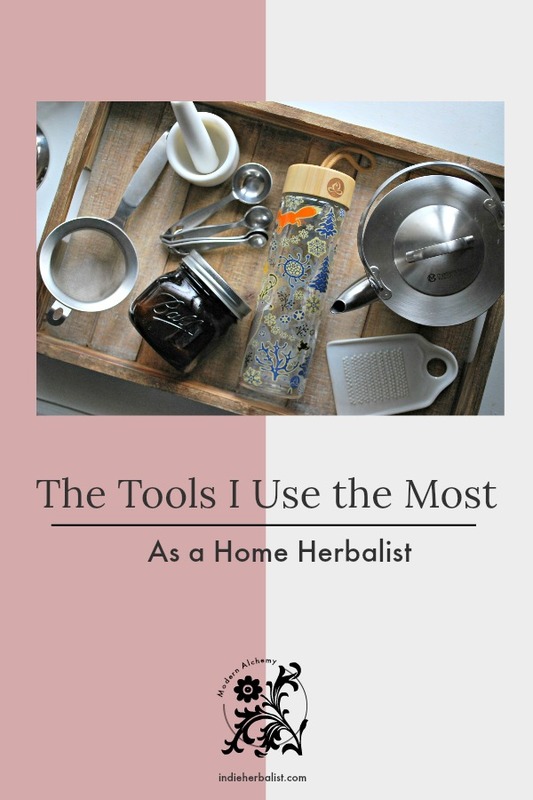 Keep reading to discover my favorite tools of the trade and a few things that I personally find indispensable as an herbalist! There are definitely a few core tools that get more use than any of the others. Here are the mainstays of my home herbalist tool chest. I’ve found that the following are especially sturdy and versatile, so they are the ones I turn to the most. I love that Ball makes amber glass canning jars now! It was so exciting to find these at my local grocery store last summer. I mainly use them to store dried herbs from my garden, but I also like making alcohol based extracts in them. It is amazing what a difference keeping your herbs in the dark can make in preserving their potency! Now I feel comfortable leaving my macerating tinctures and dried herbs on the counter rather than stashing them in a cabinet. The jars come in 16 oz and 32 oz sizes. Metal lids tend to corrode and contaminate herbal preparations, so I often use these BPA-free, reusable plastic lids instead. Two features common on home kettles are doom for home herbalists. Plastic handles and whistles break easily, and enamel will eventually chip. Trust me, I speak from experience. . . Before I found our stainless steel kettle, I went through at least a kettle a year! Yes, I know. I make a LOT of tea!!!! Our stainless steel kettle has lasted four years so far and still looks like new. They cost a little more and they can be a bit harder to track down, but they are worth the search and the investment. This one is like my everyday kettle. I also have a smaller stainless steel kettle that has a tea strainer under the lid, like this one. It’s great when I’m making a pot of tea just for myself! When I have the time, I prefer a cup of herbal tea to taking an extract. The ritual of preparing tea and taking the time to sit and drink it mindfully is one of my favorite experiences when working with herbs. Accordingly, I keep a cabinet of dried herbs and have quite the collection of tea cups, mugs, and other brewing paraphernalia. 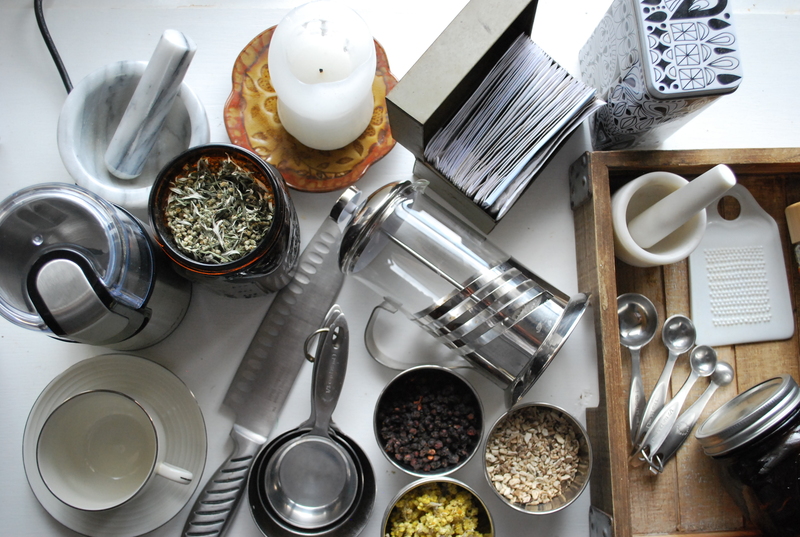 Having a designated French press is one of the easiest ways to make herbal teas. 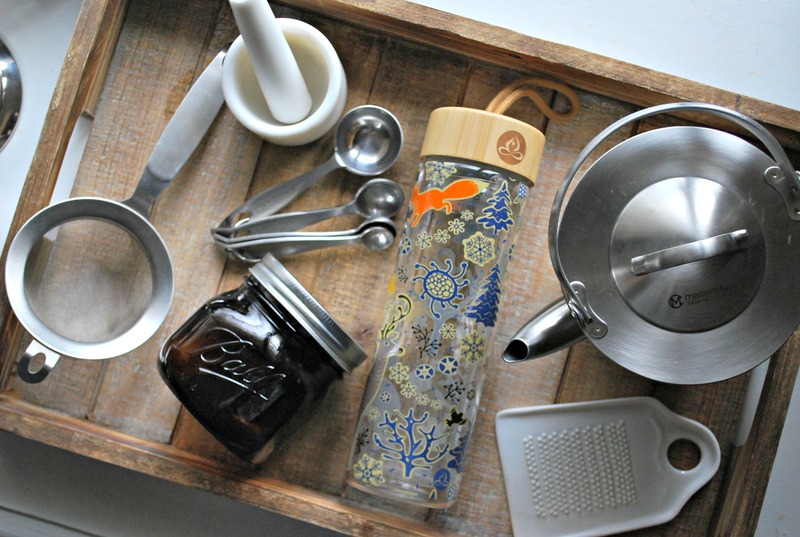 I actually wrote an entire post about how to use a French press to make your herbal infusions. Be sure to check it out if you are a tea addict too! Like the kettle, look for one that is all stainless steel or has good quality glass. Plastic will break your heart. RIP, last 2 French presses. . .
Ahh, the mortar and pestle. . . Is there anything else that makes you feel like such an herbalist as your favorite M&P? I have three. . . So, obviously, I’m hooked. BUT. Sometimes it just doesn’t work as well to powder stubborn roots and barks. A dedicated coffee grinder will get the job done a LOT faster for most herbs. As much as I love a good mortar and pestle, I also love my electric coffee grinder. The Kitchen Aid model I have right now has a stainless steel bowl that comes out for easy cleaning. My first one was a Mr. Coffee that lasted a valiant 7 years before the plastic bowl gave out, but I’m loving my upgrade to the Kitchen Aid. The bowl that separates for easy cleaning is a must if you want to use it for herbs. This is a fun piece of gear to have if you enjoy taking your herbal tea with you on the go. The double walled glass keeps your tea nice and warm, and there’s even a strainer basket that fits into the cap so you can brew right in the bottle. The top is bamboo with a plastic gasket, but seems really sturdy. I’m a tea junkie, so I consider this an essential piece of equipment. 😉 The ones I like are by Apana, because they are sturdy but also come in really cute designs. This one by Sacred Lotus is also really beautiful! Working with fresh ginger or other herbal roots is a snap if you have a ginger grater. They come in metal or ceramic. I’ve tried both, and either is a great option. I like the way my ceramic one feels. It’s heavier than the stainless steel and it’s not quite as brutal on fingertips or knuckles if I accidentally slip while grating. If your workspace has tile or concrete floors, stainless steel might be less likely to shatter if you drop it. My ceramic one has been dropped on linoleum and is none the worse for wear. A mesh strainer comes in handy when it’s time to press a homemade herbal extract. I use two layers of unbleached coffee filters to line my strainer and then decant the extract through the filters and strainer. It’s also handy if I’ve made a decoction on the stove top! The best ones I’ve bought are stainless steel and have a sturdy handle. I’ve found that the mesh tends to come loose on strainers with a plastic frame. I like having a large one and a small one handy, depending on the project. Don’t be afraid to experiment and figure out which tools work best for you. I’ve had good luck ordering some of my tools online, but I also enjoy browsing at discount home stores and thrift shops. You never know what you might find! The main thing I look for, though, is quality. Sturdy tools that will last for years are always a good investment. Are You a Home Herbalist? 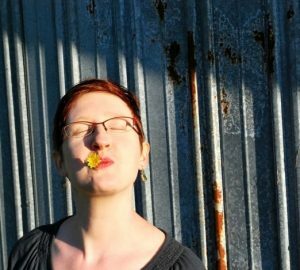 My own path as an herbalist started at home. Honestly, it was a little difficult at first to find resources and connect with other herbalists! Now I’m so grateful for the ways I’ve found a community online and in person. Are you just getting started as a home herbalist? I’ve put together a series of blog articles just for you! Sign up for my email newsletter so that you never miss a post. You can also follow along with me on Instagram and Facebook.